Browsing through the blogosphere, looking for something easy to make for a weeknight dinner, I came across a recipe for Hearty Tomato Kale and Mushroom Pasta Sauce over at Fake Food Free. I made few minor adjustments to fit our tastes and found myself with a quick, healthy pasta dish that I know I will be coming back to again and again. I'm submitting my version of this great recipe to Presto Pasta Nights; being hosted this week by Heather over at Girlichef. Don't forget to stop by sometime on January 21st and check out all the great submissions. Heat the oil in the skillet, add the garlic. Roughly chop the tomatoes and place in the skillet. Add the mushrooms and cook for 2 to 3 minutes over medium heat. Add the spinach, stir to coat with any oil and the other ingredients. Add the water, place a lid on the skillet. Simmer for 10 minutes stirring occasionally. The tomato should break down completely and the spinach should be tender. Remove lid and stir in the sugar, balsamic vinegar, basil, oregano, salt, black pepper and red pepper. Cook for 1 to 2 minutes more and serve over pasta. This is a deliciously healthy looking pasta dish - definitely one to try. I'm intrigued by the addition of sugar and balsamic vinegar, though with the tomatoes I can see how it would work. Great dish. This looks so simple...yet so delicious. 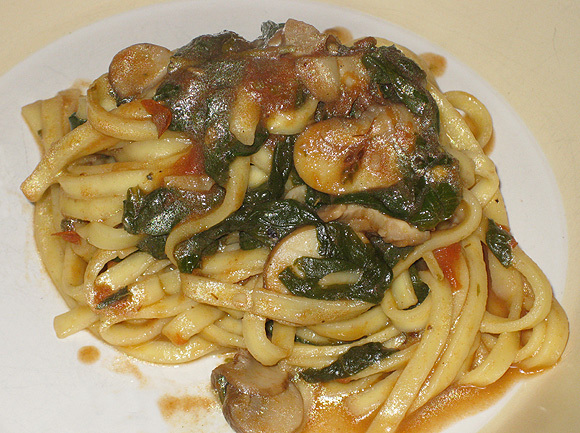 I can't get enough of mushrooms, and spinach has so many good vitamins. Thank you for sharing another great recipe, my friend! I feel like I'm getting healthier just from looking at this! Sounds like a delicious sauce. I love how you packed so many vegetables into this dish. Looks great! I love pasta dishes like this - packed with veggies! Delicious. This looks delish - great comfort food, healthy too ! I just printed this one, it’s exactly the thing we love at our house. Great looking too! Glad you gave it a try. Looks great and I love the variations. Thanks for stopping by my blog - I hope you'll come back! That's a great combination, I like the balsamic vinegar touch.